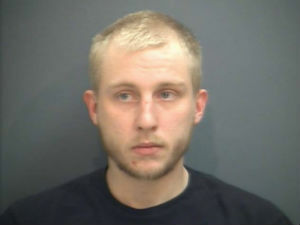 Andrew Clay Ottinger, 26, has been charged with one count of abuse or neglect of a child under his supervision. Ottinger, who is the mother’s live-in boyfriend, is not related to the child. On Wednesday, a concerned caller, who had seen marks on the child, notified the police department. An officer was sent to a residence in the 1900 block of Monticello Avenue to investigate the complaint. When no one was answered the door, a plainclothes officer set up surveillance on the house. Ottinger and the girl’s mother, 19, then arrived at the residence with the girl. They were both detained when the officer detected recent marijuana use by them. Detectives and Child Protective Service workers with the Department of Social Services observed welts and bruises on the child’s face and body. She was taken to Augusta Health Emergency Department for treatment. It was determined she also had rib fractures on both sides of her body. She has put in the custody of other family members. Additional charges are pending. Ottinger is being held without bond at Middle River Regional Jail.